For any payment to be made taxable under the head ‘Salaries’ it must fulfill the following characteristics. In case any receipt is not covered under any of these features it will not come under this head. For a payment to fall under the head ‘Salaries’ the relationship of employer and emplqyee must exist between payee and the receiver of the salary. The employer may be a Government,\. a Local authority, a company or any other public body or an Association or H.U.F. or even an individual. Every kind of payment to every kind of servant, public or private, however high or low placed he may be, is covered under the provisions of this Act. Even the remuneration payable to an employee of a foreign Govt. falls within this section. Even servant is an employee, but an agent may or may not be employee. A detailing agent of a selling concern is its employee whereas the person holding an agency to sell the goods of such a concern will not be employee. The relationship of master and servant is the only test to establish the relationship of employer and employee. A director of a company, though holding an office, is not an. employee unless it is so provided in the independent contract, or the Articles of Association of the company provide for such a relationship. Any amount of salary received or due from one or more than one employer/source shall be taxable under this head. Such situation may arise when an employee is working with two employers simultaneously or has worked with one employer and later on serves with another employer after leaving service with, first employer, salary from both the employers shall be taxable under this head. Salary received or due from present, past or future employer is also taxable under this head. Sometimes, the employer allows an employee to draw tax-free salary, e.g., the employer pays full salary to the employee and also pays tax on this directly to the department. The employee’s assessment is to be made not on the amount of salary he is drawing but on gross amount i.e., salary drawn plus the tax paid by the employer. Salary received by a member of Parliament is not taxable under the head ‘Salaries’. It is taxable as income from other sources’. Any allowance received by them is fully exempted from tax. Perquisites or benefits or any other remuneration received from persons other than the employer, would be taxable not under the head ‘Salaries’ but under the head ‘income from other sources’ even if they accrue to the employee by reason of his employment or while he was discharging his normal duties, e.g., amount received by a professor of a college for acting as an examiner in a university. For example, Dr. Dhir is an employee of a leading physician of Delhi. In one case, the patient’s life was saved because of the hard work and intelligence of Dr. Dhir. The patient, therefore, gives 5,000 to Dr. Dhir in appreciation of his services. The amount in this case is not chargeable as ‘salary’ but constitutes income from other sources. A pension payable outside India to a person who has gone to foreign country for permanent settlement is not deemed to arise in India, if pension is payable to a person appointed by the Secretary of State or to a person who was appointed before 15th August 1947, as a judge of the Federal Court or of a High Court and who continued to serve on or after the commencement of the Constitution as a judge in India. This is a special concession granted to certain officials of Government, who were employees before independence but continued to serve after this. The Govt. of India employs Indian citizens for services to be rendered in foreign countries and salary paid outside India is deemed to accrue or arise in India. This provision helps in taxing the salaries received by Government servants posted abroad. But under Section 10(7) the allowances and perquisites paid or allowed by the Government outside India are to be excluded from total income. 1. Deductions made to recover the loan advanced by the employer. 2. Employee’s contribution towards the provident fund, income-tax and profession tax. 3. Deduction made to pay the premium on life insurance policy of the employee. 4. Any other deduction for which the employee has authorised the employer. 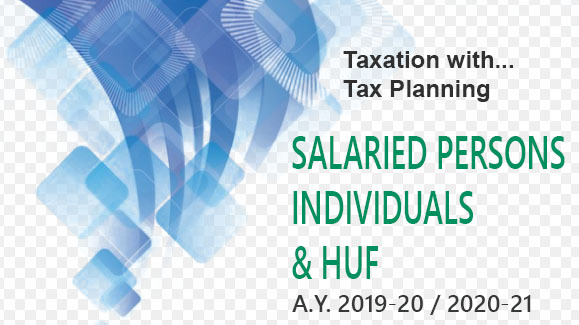 In case an employee receives his salary after certain deductions made by employer on account of profession tax, contribution to provident fund, tax deducted at source, the ‘salary’ will not be the net amount received, rather it will be the gross salary due to the employee. It is fully exempted as per circular No. 293 Dt. 10-2-81. Any salary, commission or remuneration received by a working partner from a firm assessed as firm shall not be taxable under the head ‘Salaries’. It is taxable under the head Profits & Gains. Any ex-gratia payment or compensation given to widow or legal heirs of an employee who dies during service is not taxable as salary income but family pension received is taxable under ‘other sources’. Payment made by an employer to his employee after the cessation of his employment is also taxable under the head ‘Salaries’. It is taxable under this head because it represents remuneration for services rendered in the past. Voluntary foregoing of salary by an employee is simply an application of income by him and, therefore, any voluntary foregoing of salary is taxable when it is due, whether paid or not (Section 15). The salary which is voluntarily foregone must be actually due in the name of the employee. Voluntary foregoing is different from voluntary surrender of salaries which is exempted from tax. The previous year for the income under the head ‘Salaries’ shall always be financial year of the Government of India (i.e., April to March). If salary is due on 1 st. day of the month, during the financial year 2013-14 first salary shall be due on 1st April 2013 and it shall be for the month of March 2013 and last salary shall be due on 1st March 2014 for the month of February 2014. If salary is due on the last day of the month, during the financial year 2013-14 first salary shall be due on 30th April 2013 and it shall be for the month of April 2013 and last salary shall be due on 31st March 2014 for the month of March 2014. In some organisations like Government offices, Banks, Post Offices, Railways, Universities, Colleges etc. salary to employees is paid as per pay scales or salary grades. The pay sc,les fixes the starting salary of an employee and also the annual increment in future years of employment. The annual increment is granted to employee after completion of one full year of service e.g. if an employee joins his service/job on 1st September 2010, he will be granted 1st annual increment w.e.f. 1st September 2011. The amount mentioned in between two big amounts is known as annual increment i.e. the salary of employee will increase by this amount on the completion of every 12 month of his job. Example. Mr. A joined his job on 1st September 2009 in the grade of 12,000-500-20,000. Find out his salary for the previous year 2013-14. In case an assessee receives some salary in advance in a previous year which was actually not due in that year, it shall be taxable in the year of receipt. In case, any loan or advance is taken it is not treated as advance salary. Any amount of salary received from present or past employer during relevant previous year and which relates to some earlier previous years, is treated as arrears of salary. It is taxable in the year in which received and not the year to which it belongs. [C.I.T. v. Gajapathy Naidu (1964) 58 I.T.R., 114 (S.C.)]. In case assessee has to pay tax at a rate higher than that at which he would have paid, had these arrears been received in the year to which they belong, assessee can apply to Income-tax Officer for relief u/s 89(1) (Refer to Chapter 2 of part III of this book). To terminate the services of an employee it is essential to serve a notice as per service agreement. In case it is desired to relieve the employee immediately, he is given salary in lieu of such notice period. Such amount is fully taxable under the head ‘salaries’ on receipt basis.